How to move TO3000 from PC to a laptop? To move your TO3000 data from PC to a laptop, please create a backup of your Translation Office 3000 database, copy this backup file to your laptop and restore the TO3000 database from the backup file. 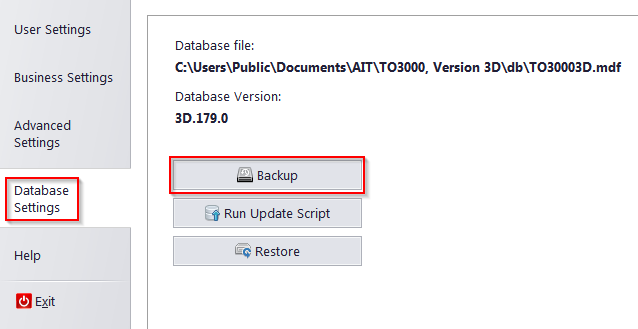 To create a backup of TO3000 database or restore a database from a backup file, please use the Backup and Restore functions in Database settings. Important notice: we suggest you make a backup of your TO3000 database before performing any actions with it. Also if you want to use all your previously added files from Business folder, please move this folder to your laptop and specify it in the Advanced Settings > Folders > General tab. By default, Business folder of TO3000 is located in the root of the C drive (C:\Business).